One Nail To Rule Them All: More valentines and a new technique! Hey everyone! So yesterday you got 2 posts in one day, dont expect that very often because it probably wont happen again haha. 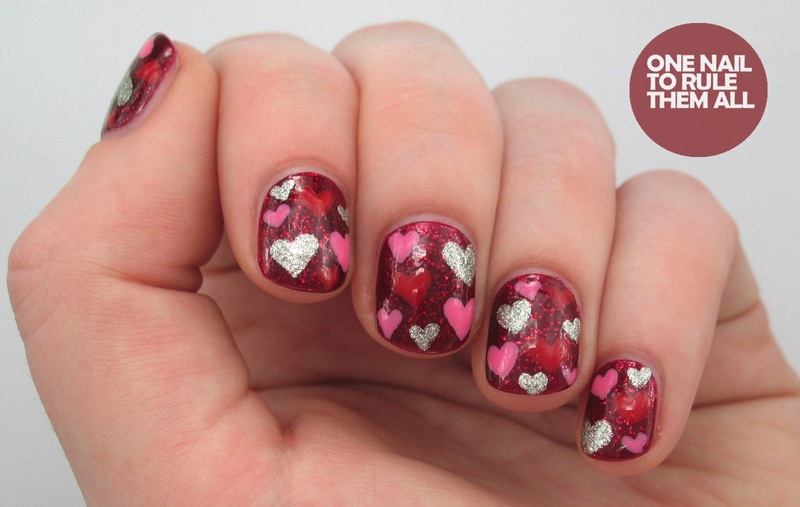 Anyway, today's post is yet more valentines day related nails, please tell me when it gets too much because I absolutely love doing hearts and I have a couple more designs planned yet! I also wanted to test out a new technique that I'd heard about, using my new bottle from Born Pretty Store. 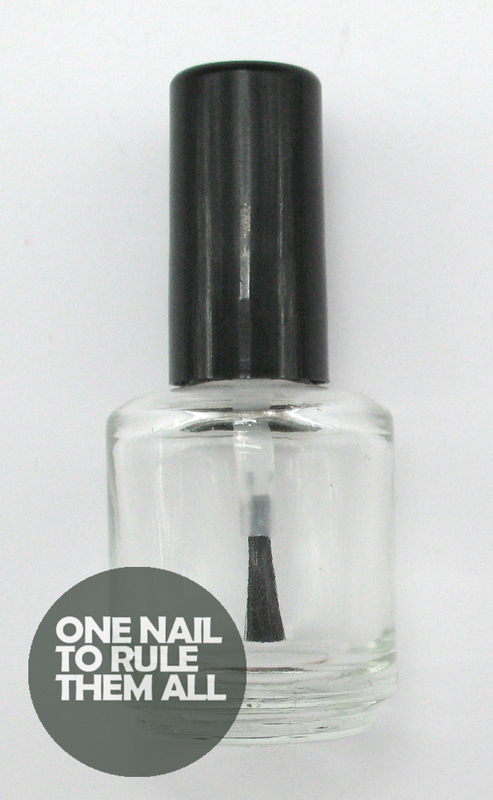 So I filled the bottle with PVA, and then applied it to my nails just like normal polish. My lovely friend Emily advised me to wait 20 minutes, or at least until it was completely clear and dry to touch, so I did. And then I removed it tonight, it was SO easy, I will be using this every time without a doubt. I'm afraid the removal picture is awful quality because my camera is dead and I need to buy some more batteries so my phone shall have to suffice. Before I show you the removed nails though it's probably best that I actually explain the nails! I used my set of Essie minis from the Winter 2012 collection which includes leading lady, snap happy and beyond cozy, all of which are beautiful, and I also added Barry M - Bright Pink. The base is of course leading lady. 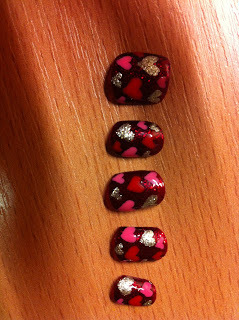 I used a small detailing brush for the hearts. These pictures truly don't capture the beauty of leading lady, it's so so beautiful. As you can see they all removed perfectly and there was absolutely no damage to my nails after at all. If you put PVA on your skin and peel it off (which by the way, is AWESOME, and your childhood probably included doing it at some point) it doesnt damage the skin, and it doesn't damage your nails either. I would 100% recommend this technique, and for those of you who are incapable of cleaning bottles just like me then you can get an empty bottle here at Born Pretty Store, and if you use my code KHL91 then you can get 10% off! What do you think? Both of the nails and of the technique? Let me know in the comments, I love reading what you have to say. Love these hearts! The design is just so adorable, and I like how you mixed the cremes and glitter. And wow, they came off really cleanly! I literally just filled an empty bottle myself, not 4 minutes ago, to try this technique out for myself. Keeping fingers crossed! Love, love the nails!! Does the PVA layer start to lift after a couple of days? I like my manis to last!! 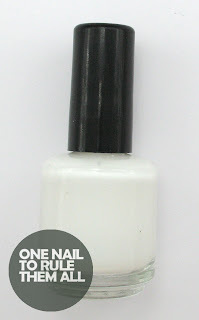 i might have used too much glue but when i did this one of my nails pooped off after a few days, so i wouldn't use this unless you just like a short mani. 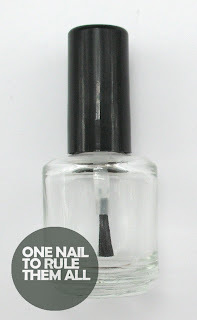 I've also found that a thick coat of Gelous as a base coat comes off nearly this cleanly and easily, but only after wearing it for several days. When I tried it again on a day old manicure it just chipped off and I stopped trying cause I was afraid it was stuck too hard and would damage my nails. LOVE these nails! OMGosh, I think this design has literally been floating around in my head since January, but I couldn't quiet put it together...so happy u did so I can try it now lol! I've been trying, & trying, & retrying the glue base since the first day I heard of it last year, but each & every time (even tho I'm very particular to do it right) it just never works out. They come off in bits & pieces & even worse (no matter if I wear a base coat or not) it tares & peels the top layer of my nail! More & more I'm finding Seche Vite does come off like the pic tho....weird huh?! I love glitter, but HATE removing it so much that I normally won't wear it! :( Anyway...BEAUTIFUL nails, & btw, I think Leading Lady may lead to my first Essie!! lol;) Reminds me of Ruby Pumps (which I love). these are so cute! I really love the colors and your hearts are perfection. 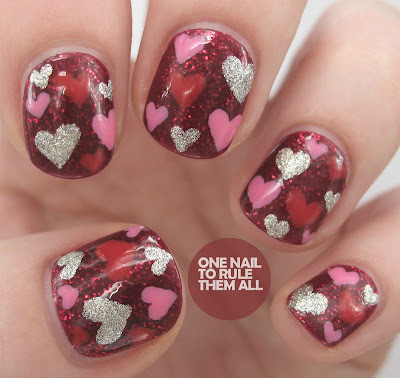 I'm like you, I can't get enough of painting hearts on my nails! For love & heartbreak week for the digit-al dozen the only thing I really want to do is five days of different types of heart nails but I feel like everyone would end up hating me afterward haha. I've never tried the glue technique but as much as I love glitter I really should. These look amazing, the colours go really well together. I've seen a few people try the PVA method, but have heard it can be really easy to catch them on things and the entire nail comes off, have you had that problem at all? I used Essence Peel Off Base and its much the same as using PVA glue :) Its the only product I'll use now when wearing glitter/confetti polishes!! I'm beyond grateful Pretty Purple Polish and, hm, Lab Muffin, I think, for writing about the PVA thingie - they made me clean up a used bottle of polish in an instant :D .
I think I need some practice with the technique (*cough* more patience *cough*), but the first results are really promising :) ! These look awesome! I need to try that glue peel off base! how long can the nails last if you use PVA as the base? 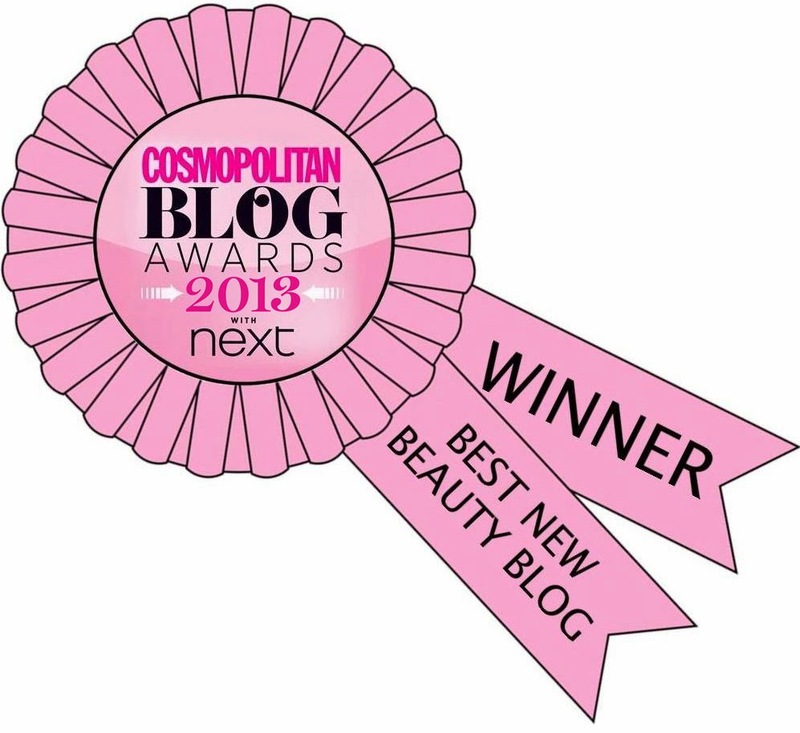 Thanks for following my blog :D Your designs are amazing! I love the hearts (: that's a really good tip too, im always worried about damaging my nails! I've only heard about this technique in passing, might have to give it a go! The trick I've found to removing glitter polish is to use medical type gauze with your nail polish remover instead of cotton balls or towelettes. the medical gauze grabs the glitter and removes it a lot easier then soaking or nail wraps. I have to agree though that this is a great idea for someone who doesn't want to have to deal with a messy clean up of glitter polish.